Aminé is a young, up and coming rapper from Portland, Oregon. Releasing his first mixtape in early 2014, Aminé rose to the national spotlight with the release of his song “Caroline”, which reached number 11 on the Billboard Hot 100 and was certified triple platinum by the RIAA. This lead to Aminé earning a spot as one of the ten members of the vaunted XXL "Freshman Class", and the release of his debut album, Good For You, in 2017. The song “Campfire” is his latest single, being released in early 2018, and features the Arizona trio Injury Reserve. The music video was also released in April of 2018, and has accumulated over 7.5 million views. Aminé wears black low cut chucks in this music video. The song is about how hot Aminé is right now, which he likens to being hot like a campfire. Aminé’s flow and sound is very similar to artists like Big Sean, and the actual beat sounds a lot like Sage The Gemini’s 2013 hit “Gas Pedal”. That being said, this doesn’t take away from the fact that Aminé has some pretty great one liners, including the line “I love my whips like a racist and travel lot of places”. Overall, this is a pretty mellow song that’s full of wordplay and past song references. This video takes place in a rural setting, which is completely the opposite of the the genre, artists, and vehicle. The video begins with Aminé and Injury Reserve’s Ritchie with a T standing in front of a burning tree while wearing neon pink and green wigs. 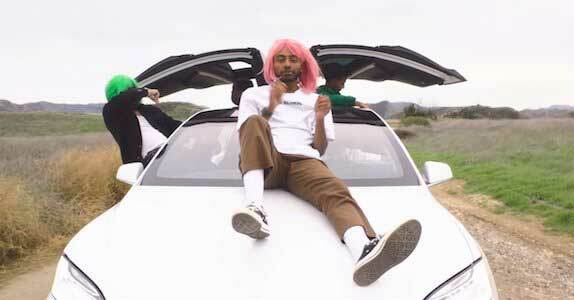 Aminé is wearing black low cut chucks with khaki pants and a white shirt, all of which is really highlighted by the sheer brightness of his pink wig. The next scene is Aminé riding on the hood of a Tesla while Injury Reserve drives with the vertical doors up. The whole video is a play on the rural setting mixed with the city elements of the car and the artists themselves, which really gives off some great visuals and interesting dichotomies. There’s also a brief break in the middle of the video where the music cuts out and Aminé talks about his interaction with a racoon, which is hilarious. The lowkey setting and atmosphere of the video also fits perfectly with the song’s beat and Aminé’s flow. Use the links below to get yourself a new pair of chucks for that “hot” look.